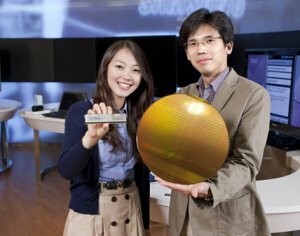 Samsung Electronics Co., Ltd., the world leader in advanced memory technology, today announced that it is the first in the industry to start mass producing 32 gigabyte (GB) memory modules, essential for cloud computing and advanced server systems, using 30 nanometer (nm) class* four gigabit (Gb) DDR3 DRAM chips. “With this module, Samsung has secured the highest level of product and solution competitiveness in the DRAM market for PC, server and mobile applications,” said Wanhoon Hong, executive vice president, memory sales & marketing, Samsung Electronics. “We also plan to ship more energy-efficient 4Gb DDR3 DRAM based on 20nm-class* process technology in the second half of this year, which will significantly expand the rapidly growing market for green IT memory solutions. Moreover, we intend to keep delivering the greenest memory products with optimal performance for customers,” he added. Samsung’s 30nm-class 4Gb DDR3 chip offers an approximate 50 percent increase in productivity over a 40nm-class 4Gb DDR3, and as a result is expected to achieve rapid market penetration. Samsung started producing monolithic 4Gb DDR3 DRAM devices based on 30nm-class technology in February, which is only one year after it started producing 40nm-class 4Gb DDR3 DRAM devices. Just two months later, it began to provide 16GB modules to a number of server system manufacturers. With its new 32GB registered dual inline memory module (RDIMM) and an 8GB small outline dual in-line memory module (SO-DIMM) added this month, Samsung has completed a full product line-up of 30nm-class 4Gb green DDR3-based solutions. In addition, by offering its new DDR3 modules shortly after providing 30nm-class 4Gb LPDDR2 DRAM, Samsung is now supporting the needs of the entire marketplace for 30nm-class DRAM solutions from mobile devices to enterprise server systems. Samsung’s new 1.35-volt 32GB RDIMM performs at up to 1,866 megabits per second (Mbps), achieving a 40 percent improvement over a 1,333 Mbps, 40nm-class 32GB RDIMM operating at 1.5 volts, therein consuming 18 percent less power. The 40nm-class 32GB RDIMM was bestowed an Eco-Design Award at the International Consumer Electronics Show (CES) 2011 Innovation Awards. Also, the new 8GB SO-DIMM version processes data at up to 2,133 Mbps when operating at 1.5 volts. Samsung expects to have more than 10 percent of its total DRAM chip production in 2012 at the 4Gb (or higher) density. According to IHS, shipments of 4Gb DRAM are expected to account for approximately 10 percent of total DRAM shipments in 2012, 35 percent in 2013 and up to 57 percent in 2014. Meanwhile, Samsung plans to keep raising awareness of its green memory initiatives and its ‘Creating Shared Value’ (CSV) approach toward the global IT industry, as it seeks greater collaboration on energy-efficiency with CIOs of global companies.